This is Renia, who was murdered on the streets of occupied Przemyśl at the age of 18 in 1942. She left behind a diary that through some miracle found its way to her family in New York. I grew up calling Renia’s sister “Aunt Elizabeth,” but she never mentioned her sister until a few years ago. Encouraged by her daughter Alexandra, they started looking for someone to translate the diary from Polish to English, and Elizabeth started talking about her hidden past. It’s an extraordinary story about two extraordinary sisters. Both Elizabeth and Alexandra will share their stories at 1 PM eastern time today, November 8, 2018. Would You Live in the Ghetto? The Stare (Old) Podgórze district of Kraków, nestled between the Vistula River and the hilltop Bednarski Park, has experienced an incredible resurgence over the past several years. What used to be a neglected part of the city, with crumbling townhouses and drunks who congregated in the town square, has become the home of restaurants, cafes, galleries, and museums. A new pedestrian bridge links Podgórze to the heart of Kazimierz; the rhythm of footsteps over the pedestrian walkway causes sculptures suspended from wires to totter like the acrobats that are depicted. Pedestrian Bridge connecting Podgórze and Kazimierz, Krakow. Sculptures of acrobats suspended on wires, by Jerzy Kendziora. A biker pedals by a sculpture of an acrobat suspended on wires, historic Podgórze in the distance. The pedestrian bridge between Podgórze and Kazimierz, Krakow. Old Podgórze is also the place the Nazi governor Hans Frank selected for the Krakow Jewish ghetto on March 3, 1941. “Within two weeks, 18,000 Jews were ordered to move to 320 buildings, whose ‘Aryan’ residents had previously been forced to vacate.”  Presumably, the district was selected because of its distance from the center of town, further isolated on the other side of the river. By March 20, Podgórze was closed off by a high brick wall; whether the symbolism was intentional or not, the undulating curves along the top edge evoked Jewish headstones stacked side by side. The ghetto shrank in 1942, when residents were taken to their death in camps like Bełżec, and was completely liquidated on March 13-14, 1943. The ghetto existed just two years, but the fact that it existed at all in this very place clashes uncomfortably with the district’s rebirth. I have written about Podgórze before, and about the way the district captivated me. In fact, I’ve sometimes remarked that if I were to buy an apartment in Krakow, I would want it to be in Podgórze. But that was before I knew what happened there during World War II, before I started to explore my Jewish heritage, before historical markers brought difficult history back into the public sphere, and before the phantom walls of the ghetto became part of my inner map of the district. When I visited Krakow earlier this summer, I decided to rent an apartment in Podgórze to get a better feel for the place. Could I live there, knowing what I now know? I found a place right in the heart of what used to be the ghetto, in a newly renovated building right beside a ruin, and across the street from the iconic red brick mikvah building that now houses one of the city’s most prestigious art galleries. Podgórze, crumbling ruin beside new renovation. I took long runs past St. Joseph’s Church on the Podgórze Market Square, over the hills of Bednarski Park, and through the narrow streets. I visited the remaining fragments of ghetto wall. A short section on Lwowska Street includes a plaque on which is written in Hebrew and Polish: “Here they lived, suffered, and died at the hands of Hitler’s torturers; from here they were taken on their last road to the death camps.” A larger section separates a school yard from the park; I came upon a group of Israeli teenagers whose armed guards asked me what I was doing there. I came to see the wall, I replied. I watched for a bit as their animated tour guide seemed to be reenacting the experiences of ghetto captives. I waited for trams at Ghetto Heroes Square, sitting on the chairs that are part of the memorial to those who waited at this very spot to be transported on that final road to their deaths. Map of Podgórze, including Jewish ghetto boundaries. Could I be witness to this on a daily basis? Maybe if I lived in Podgórze, but outside the borders of the ghetto? But that seems no better—to put myself in the position of those who watched from outside the walls. So my love of this space—a quiet corner just a short walk from the heart of the city—battles with the discomfort of flashes of a painful history. Could I live there? Could you? Potel, Jean-Yves. 2010 Koniec Niewinności: Polska Wobec Swojej Żydowskiej Przeszłości. Translated by Julia Chimiak. Krakow: Znak. P. 128. Just about every time I come to Warsaw I take a pilgrimage to this spot. The view down to where my mother used to live, when Kościelna Street continued straight at the bottom of the stairs. My mind turns inward to the way I remember it in my imagination, based on my mother’s stories and archival photos. Back then, these stairs led to a neighborhood of narrow streets where old cottages sat beside brick businesses, and where my grandfather built my grandmother a three story villa behind a cast iron fence. When I visited today, I pictured roads instead of pathways. With buildings on either side. The villa would have been straight down and on the left, just after the path that runs perpendicular. For some reason I started to wonder what my mother’s life would have been like if there hadn’t been any war. Would she have married her first love, a priest? Or would he have decided to honor his vows to the church? No doubt, she would not have waited to have children. I imagine her with four, including the daughter that was born instead of me, only 10 years earlier. No need to wait through the war, dozens of surgeries, migration, and illness to start a family. Would she have resigned from her dream of becoming a doctor, or found a way to balance her home and work responsibilities? Maybe she would have lived with her active young family in the villa, where her mother could help. And the daughter that was born instead of me would no doubt be a grandmother, with a grandchild the same age as my son. Without the Nazi invasion, Poland’s Jews would not have been murdered, and the Soviets would not have imposed 45 years of state socialism. Instead of being destroyed, Warsaw would have continued to grow, its Jewish population an important component of the city’s economic and cultural vitality. Poles would have had to figure out how to live within a country full of diversity, where the Polish nation could not be defined as ethnically pure or exclusively Catholic. Would my family still have hidden their Jewish heritage in such a Poland? I wonder. What do you think? Today in The Forward is an article Why Renia Spiegel is Called ‘The Polish Anne Frank‘. During the Nazi occupation of Przesmyśl, Poland, she filled notebooks with her poetry and diary. 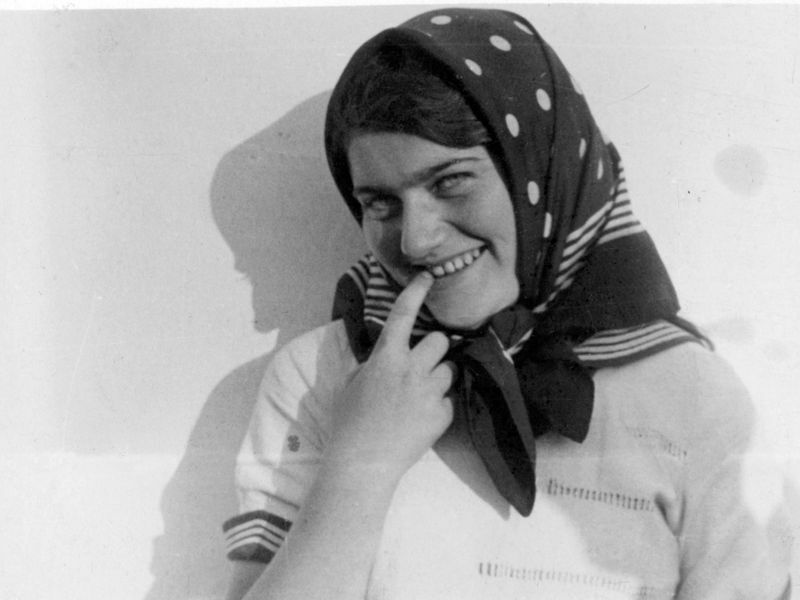 Renia was only 18 when she was shot on the street, after someone reported her hiding place to the Nazis. Ariana, her younger sister, survived because she had been brought to Warsaw just a few days before that. Ariana became Elizabeth, whom I grew up calling Aunt Elizabeth. She was my mother’s friend for nearly 80 years. Sorry it’s taken a while for me to get to part III. The semester has begun which means I’ve been very busy. Pencil sketch of Maria Bereday from the 1950s, signed Ditri. Friends tell me she looks like a spy. Initially, neither Krystyna nor I found this file because not only was “Bereda” missing, but Fijałkowska was also misspelled. Krystyna wrote “Fijałkowska” on a new envelope; I don’t know why she didn’t also add the Bereda, even after I pointed out that Mama’s full name was hand-written in large letters along the left margin of the document’s first page. Around World War II, the family usually used the name Bereda-Fijałkowska. Mama told me they added the Fijałkowski/a, which was grandpa Bereda’s mother’s maiden name and a name associated with the Polish gentry, because of Babcia’s social aspirations. Mama’s name (Bereda-Fijałkowska) and pseudonym “Renata” in the margins of her typewritten report. Mama’s report matches up with some of the stories she told me, and confirms some of what she did during the occupation. It also gives more details about the way her courier unit “Zadra,” was organized, and how couriers carried out their duties. The report is dry and factual. It contains no specifics about her emotional engagement or personal thoughts. A historian might find it interesting for what it reveals about the operations of the Underground conspiracy. I keep trying to look beyond the words to find the person behind them. She writes, that “Zadra” started out very small, and because the work wasn’t systematized, the couriers were on call at all times. “By the end of 1942,” she writes, “the number of couriers stabilized at 15, and that group became close and experienced, and worked together for a long time without changing members.” This all changed in the fall of 1943 when the occupier, okupant, limited train travel to Germans only. Overnight, the courier corps dropped from 60 to just six who spoke German well and had German papers. “The work for these couriers during this time was nonstop,” she continues, “The number of trips for each courier came to 10-12 per month, depending on the route.” My mother doesn’t state it in the report, but she must have been one of the couriers who carried out missions during this time. Some of her most vivid stories were about traveling in the train cars with an assumed identity as a “volksdeutch,” a half-German whose father was fighting for the Reich on the Eastern front. After about two months, the courier corps were reorganized and expanded, with more reserve couriers brought into regular service. In the half year before the Warsaw Uprising, the number of couriers in her unit approached 40, and overall reached 100. The duties of the couriers included delivering coded and uncoded orders hidden in ordinary objects such as candles or paint, special messages that had to be handed to specific commanders, and large sums of money (1/4-12 million zloties in 500 zloty bills). Some missions involved carrying the messages brought by paratroopers they called “ptaszki,” “little birds.” This is the code name for the cichociemni, the officers who parachuted in from the West carrying money and messages from the Polish Government in Exile. The report includes an example of a special mission Mama undertook at the end of 1943. Instead of being briefed by her usual commander “Wanda”, “Beata,” the head of communication with the west, did it. “Wanda” gave her a special coded message she had to hand directly to the chief of staff or the commander of the Radom District. This was to occur in private with no witnesses. Mama also had to memorize and deliver the oral message, “The commanders of the divisions and subdivisions of “Burza” require complete secrecy in the event of the invasion of the Russians.” Burza, Tempest, was the code name for the Warsaw Uprising. Because the chief of staff wasn’t available on the day Mama arrived, she had to spend the night at a safe house. The next day, she delivered the messages to Chief of Staff “Rawicz” [his real name was Jan Stencel or Stenzel], but had to spend another two days before “Rawicz” returned from the forest, where the partisans were hiding out, with the required response for the Central Command in Warsaw. Reading this sparked another memory for me. I think it was a big deal for Mama to stay away from home for so long, especially because her father didn’t know she was in the Underground. Her mother did know, though, and they hatched an alibi about a visit to Mama’s fiance’s family. Or maybe this is the story she told the authorities on the train to explain why she was returning several days late. Hopefully, my brothers remember this story, too, and can confirm one of these versions. The documents from the Studium Polski Podziemnej in London have been a lynch pin that holds together information from a variety of sources. While I was there, I also found a citation for Communication, Sabotage, and Diversion: Women in the Home Army, Łączność, Sabotaż, Dywersja: Kobiety w Armii Krajowej, published in 1985. The book was written in Polish but published in London. I found a copy of it at an online used bookstore whose brick and mortar shop is in Warsaw. I called, and sure enough they had it in the shop, so I picked it up while I was in Warsaw. It contains the recollections of the head of the Women’s division of Central Command (VK) Janina Karasiówna, the oficer who confirmed Mama’s verification file. Another chapter contains the report of Natalia Żukowska who was the assistant commander of Mama’s courier unit; Mama identifies her by her pseudonym “Klara.” From Żukowska’s report, I learned that “Zadra” was the name used by the couriers who had been working with the unit for the longest, but in 1943 the name was changed to “Dworzec Zachodni.” Reviewing Mama’s documents, I see now that she identified her unit as Zadra-Dworzec Zachodni in one place. She underlined it, too. Until I read this book, I had thought Dworzec Zachodni, which means Western Station, referred to Zadra’s location, not an alternative cryptonym. And then there’s this: the names of the 15 couriers, including “Renata.” That’s Mama’s pseudonym; her last name is misidentified as “Brodzka” instead of “Bereda,” but Natalia writes, “Unfortunately, it wasn’t possible to decrypt all of the last names” (p. 118). Mama was proud of her service for her country, but she was also painfully aware of the cost of war. She called herself a pacifist and the war solidified her abhorrence of armed conflict. I remember her asking, “Are there times when fighting is necessary?” I could tell from her voice that she wanted to believe all conflicts can be resolved peaceably. But her experience had taught her otherwise. Mama started military training in middle school, gimnasium, at the Klementyna Hoffman School in the mid-1930s. She continued training in high school, liceum, and entered the Underground in June 1941, right after finishing high school. She took courses on how to be a courier, the organization of the Underground and of the German military, as well as marksmanship, topography, and first aid. She was in “Zadra” Group, part of the women’s courier corps in the 5th Division of the Central Command. She delivered encoded communications, money, and oral messages on the routes between Warsaw and Krakow, Radom and Skarżysko-Kamienna. In these latter two places, she acted as a go-between for the partisans in the surrounding forests and Central Command in Warsaw. From 1942-4, she also worked as an instructor training other women to serve in the Underground. When the Warsaw Uprising began on August 1, 1944, she was with her unit “Zadra” in Wola, a district to the northwest of downtown. A handwritten note on her typed questionnaire says “wounded on route from Wola to the Old City.” The handwriting is different from Mama’s distinctive, almost calligraphic style, so somebody else must have added it after Mama submitted her answers. The archivist Krystyna Zatylna said that the heaviest fighting in the first days of the Uprising was in Wola. Mama was lucky to have survived. By August 8, 40,000 civilians died in Wola. The Home Army regrouped in the Old City. Mama got separated from her unit and joined “Koło” group. She is referred to here as a “liaison,” “lączniczka,” rather than “courier,” “kurierka.” Both terms refer to people entrusted with delivering critical information. Initially, however, she worked as a medic on Długa Street. When the Germans pushed the partisans out of the Old City, they escaped to the City Center, Śródmieście, via the sewers. Document dated September 9, 1944 that allowed “Renata” to travel through the City Center during the Warsaw Uprising. I assert that cadet Renata is a liaison of “Koło” Group. The conditions of her service require movement within the region between Savior Square and Napoleon Square. The note is signed by the Chief of Staff of “Koło” Group, Major Krynicki. The document contains a round stamp with a crowned eagle in the middle surrounded by the words “Motorized Transport Brigade, “Brygada Dyspozycyjna Zmotoryzowana.” Mama must have shown this note at barricades on the streets so the AK soldiers would let her pass. Savior Square and Napoleon Square are in the City Center, which means she retreated through the sewers before September 9. I can, however, imagine her dodging Nazi bullets as she ran across the barricaded Jerusalem Street carrying messages from Napoleon Square to Savior Square. These names would sound good in a poem. Too bad I’m not a poet. I confirm that “Renata Lewandowska” was decorated for her activity during the Uprising from August 1 to October 3 1944 with the Cross of Bravery for the first time. Based on: the personal confirmation of the head of the Warsaw Corps of the A.K. Brigadier General Montera and his assistant Colonel Wachowski, as told to the commander of “Koło” Group during the last days of the Uprising. “Montera” was the code name for General Antoni Chruściel, who led the Home Army (AK) in Warsaw during the Uprising. Kołodziejski was also a code name. Elsewhere in the documents, Mama writes that his real name was Zygmunt Trzaska-Reliszko. Mama writes that she was promoted twice; in September 1944 she became a cadet, plutonowy podchorązy and in October she was promoted again to ensign, podporucznik. It looks as though the Verification Commission could only confirm the first promotion. A handwritten note on Mama’s questionnaire says they weren’t able to contact her commanding officer from “Koło” Group to verify the second promotion. As the chief of the V.K. [5th Women’s] Central Command I certify that in the course of her service as a courier, “Renata” Maria Bereda Fijałkowska distinguished herself on the route Warsaw-Krakow and Warsaw-Skarzysko-Radom with bravery and decision to take risks. Traveling with German false papers she carried money, mail, and oral orders /for example related to the order for [Operation] Tempest. She earned the Cross of Bravery for her service. Operation Tempest, “Burza,” was the code name for the beginning of the Warsaw Uprising. In other words, some of the messages Mama carried between Central Command and the partisans in the forest involved critical details about the Polish Underground’s battle to free the capital city from German occupation. I’m reminded of something the archivist at the Warsaw Uprising Museum kept repeating when I showed him Mama’s verification questionnaire two years ago: “She must have been very high in the conspiracy.” He couldn’t find the exact connection, but I believe I have it right here. Krystyna Zatylna helped me put the pieces together. The forests around Radom are where the so-called “cichociemni,” “the quiet unseen” soldiers parachuted in from the West, bringing messages and money from the Polish Government in Exile for the leaders of the Underground in Poland. I believe Mama was given these items from the cichociemni and carried them back to Central Command in Warsaw. It fits with stories she sometimes told, and it fits with the seven-page report she filed with her verification papers. And that will be the subject of the third part of this blog post. The extraordinary story of my mother’s service in the Polish Underground can be hard to reconcile with the person I knew. Mama would hide when strangers visited the house because she was afraid they would stare at her scars. How could she have carried secret messages to the partisans in the forest or talked calmly with Nazi officers on the German-only trains right under signs that read, “Danger! The Enemy is Listening!”? And yet, as her daughter I also knew her strength and persistence, especially when matters of principal were involved. I couldn’t find much specific information about my mother at the Warsaw Uprising Museum or the Polish National Archive of New Records in Warsaw. Next, I turned to the Studium Polski Podziemnej (SSP), Polish Underground Movement Study Trust in London. But when the archivist responded they have no record of Maria Bereda in their indexes, a part of me wondered if Mama could have fabricated her whole story. But that made no sense. My mother didn’t lie. She struggled with guilt even when she tried to tell the smallest untruth. Instead, she would avoid certain subjects, and would keep silent when people came to their own incorrect conclusions about them. That’s why for instance I thought she was the same age as my dad when I was a child. My oldest brother inferred it from the sequence of their birthdays—Dad’s was on March 1 and Mom’s was a few months later on June 26—and Mama didn’t bother to correct us. Mama didn’t like talking about her past, but the story about how she was verified after the war was one she was more willing to tell. She had to go to London to do it because wartime records were scattered and incomplete. During the war, the Underground Army didn’t have the infrastructure to maintain centralized records. Often, lists of personnel and promotions were memorized or scribbled on any available scrap of paper. Also, to prevent the Nazis from infiltrating the underground forces, details of separate units were kept from each other. Most partisans only knew about those serving directly above and below them, and even members of the same unit referred to each other by code name. All of these were strategies for insuring that if someone was caught or compromised, they would have minimal information to share and so could inflict a minimum of damage to the organization. Also, few records remained after Warsaw was bombed to the ground following the Warsaw Uprising. The Central Verification Commission was in London, where the Polish Government in Exile had been throughout the war. Mama travelled from Poland to London in March 1946. She wanted to be sure that an official record would exist to mark her participation in the war, and she wanted to get the Cross of Bravery she had been granted but never received. At the Commission, she reported on her training, her unit, her superior officers, and her activities. When she told me this story many years later, she was very proud of her ability to recall all these details from memory, things that could only be known by someone who actually served in the Underground. The commission checked everything for accuracy before the verification was confirmed. I already had a copy of the “Special Questionnaire” Mama had filled out as part of this process; I had found it in her papers. At minimum, I should have been able to find the original at the Polish Underground Movement Study Trust (SPP), which houses the archive of the Verification Commission. Fortunately during a recent trip to London, some focused digging at the SPP turned up a treasure trove of documents. Already in our e-mail correspondence, the SPP archivist Krystyna Zatylna had seemed confident that something would turn up if we looked harder. She eventually found Mama’s records where they had been mislabeled and misfiled. Headquarters of the Polish Underground Movement Study Trust at 11 Leopold Road, Ealing, London. Photo from studium.org.uk website. According to their website, “The Polish Underground Movement (1939-1945) Study Trust (PUMST), was founded in London in 1947. It is a research and academic institution, which contains historical material on the Polish Underground State (the Underground Administration and the Polish Home Army – Armia Krajowa) during the Second World War.” Included among their materials, the verification papers sit on high shelves right in the reading room in accordion folders shelved alphabetically. Personal files are arranged alphabetically inside the folders, each in a separate manila envelope. The first folder Krystyna pulled out for me contained last names starting with “Br” instead of “Be.” My heart fell when I didn’t find Mama’s records. But then Krystyna climbed up a wooden ladder and found the folder with the “Be” names. There it was: an envelope labeled Maria Bereda-Fijałkowska. For a time, Mama used this hyphenated name, tacking on the maiden name of her grandmother. Krystyna explained that much of the work at the archive has been done by volunteers so there are a lot of mistakes. She also asked me a lot of questions. Was Mama’s name always hyphenated? Did she use any other names? Did she ever go by Fijałkowska? Was she ever married? She also asked the names of my mother’s units. I rattled off what I knew: she belonged to “Zadra” in the Women’s 5th Division of the Central Command stationed in the Wola District of Warsaw; shortly after the Warsaw Uprising began, she joined “Koło” Group, and served in the Old City–Stare Miasto and City Center–Śródmieście Districts . I also gave her the names of Mama’s superior officers. It was as if I was being verified myself.